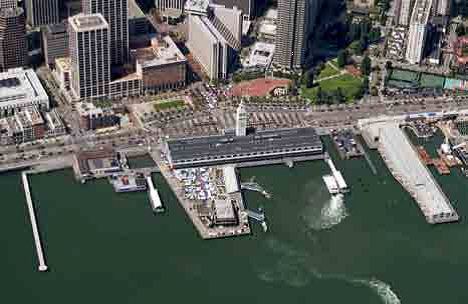 The Downtown San Francisco Ferry Terminal Expansion Project is located within the Ferry Building area - one of the most historically significant areas on the San Francisco waterfront. The Ferry Building was built at the foot of Market Street following construction of the Great Seawall, and within a short period of time became one of the busiest transportation terminals in the world, rivaled only by Charing Cross Station in London. 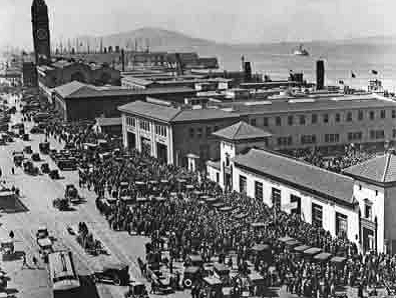 By 1930, nearly 250,000 passengers traveled through the Ferry Building on a typical weekday for a total of 50 million passenger trips per year. Following construction of the Bay Bridge and Golden Gate Bridge in the 1930s, ferry services began to decline to the point that ferries no longer served the Ferry Building by the 1950s. It was not until the 1970s that ferry service was resumed at the Ferry Building with construction of the Golden Gate Ferry Terminal. By this point, many of the existing ferry slips had been removed and the area as a whole had become dilapidated under the shadows of the Embarcadero Freeway which severed much of the San Francisco waterfront from the City. In the early 1980's, a new vision emerged for reintegration of the San Francisco waterfront with the city, with the Embarcadero playing an important role in pedestrian, bicycle and transit as well as for recreation and public access to the Bay. It was not until the City ultimately removed the Embarcadero Freeway following the 1989 Loma Prieta Earthquake that this vision began to be realized. Following the Loma Prieta Earthquake, new ferry services were rapidly deployed at the Ferry Building to shuttle commuters across the Bay during closure of the Bay Bridge. Following the success of these services, funding was secured for what would become Phase 1 of the Downtown San Francisco Ferry Terminal project. The Phase 1 project was undertaken by the Port of San Francisco and included construction of Gate B and Gate E, which today support the Alameda/Oakland, Alameda Harbor Bay, Vallejo, and Tiburon ferry services. 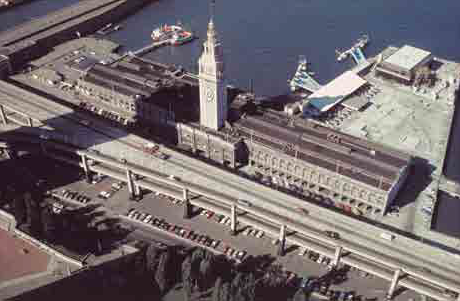 The Phase 1 effort was undertaken in conjunction with two other major initiatives: the Mid-Embarcadero Transportation and Open Space Project, which included the implementation of transportation and open space improvements in the former right-of-way of the Embarcadero Freeway, and planning and development efforts for the historic preservation and adaptive reuse of the Ferry Building. Taken together, these projects were instrumental in transforming the Ferry Building area into a vibrant hub of Downtown San Francisco once again. The San Francisco Water Emergency Transportation Authority was created to carry forth the Bay Area's vision of expanding ferry service throughout the region. The majority of new routes would provide service to Downtown San Francisco from new terminals construction throughout the Bay Area. In order to accommodate these new services, additional improvements will be needed at the Downtown San Francisco Ferry Terminal, including the construction of new ferry gates. WETA is currently working in close partnership with the Port of San Francisco through a Memorandum of Understanding to undertake these improvements as part of the Downtown San Francisco Ferry Terminal Expansion Project, representing Phase II of the broader effort to expand ferry service in the Ferry Building area.